The United States has alleged that Russia is violating the Intermediate-Range Nuclear Forces Treaty. Speaking to an ITAR-TASS correspondent, a U.S. government representative said that Russia was failing to meet its obligations to neither acquire, produce, nor test intermediate range ground-based cruise missiles. The United States has levelled accusations at Russia over its missile development program, claiming it is violating the Intermediate-Range Nuclear Forces Treaty (INF), according to statements made by a U.S. official in an interview with the ITAR-TASS news agency. “The United States has come to the conclusion that the Russian Federation is violating its obligations with respect to the INF,” the spokesperson said. The U.S. authorities' claims accusing Russia of breaking the 1987 Intermediate-Range Nuclear Forces Treaty are groundless and act as an element of Washington's information warfare, the senior vice-president of Russia's Center for Political Studies, Lt. Gen. Yevgeny Buzhinsky, has said. According to the spokesperson, America views the issue as “very serious.” “We have already tried to discuss this with Russia for some time,” the spokesperson said. In the past, Washington has indeed made public signals about its concerns with Moscow's adherence to the INF. This was underscored by a meeting with journalists held in May by the Under Secretary of State for Arms Control and International Security, Rose Gottemoeller. Gottemoeller made it clear that the meeting concerned Russia's development of a ground-based cruise missile. Gottemoeller did not specify precisely which missile she was concerned with. However, according to information from military-diplomatic sources, the State Department's rebuke was aimed at Russia's newly produced naval cruise missile. As a naval weapon, it does not fall under the limitations of the INF treaty, but for the purposes of more reliably testing its tactical and technical characteristics, the missile was tested on the ground. These tests were what aroused Washington's displeasure. In response to this accusation, Russian experts assert that the U.S. has repeatedly violated and continues to bypass the INF. Major General Midykhat Vildanov, professor at the Academy of Military Sciences, considers Washington to be in regular violation of the treaty. The U.S. has overstepped the bounds with its test firings of the Ground Based Interceptor (GBI), a missile defense system designed to destroy strategic ballistic missiles during the mid-phase of their trajectory, Vildanov explained to RBTH. Taking advantage of this, the general stresses, the American side has bypassed the INF and developed a medium and intermediate-range missile to serve as the target during missile defense tests. Furthermore, the Americans introduced the term “intermediate-range” without the consent of their Russian treaty partners. The professor notes that the U.S. does not display its new system at demonstrations or make it available for inspection, does not declare the location of launch sites, and does not provide notification when it is re-locating the missiles. Therefore, Solomonov continued, the Americans have violated the INF by developing a new medium-range rocket for their missile-defense tests. This has allowed them to complete almost 22 successful intercepts, leading to the deployment a new anti-ballistic missile system, the Standard 3. The Standard 3 also began to be incorporated into the Aegis ground-based missile defense system, deployed in Romania. In the opinion of Alexei Arbatov, director of the Center for International Security at the Institute of World Economy and International Relations of the Russian Academy of Sciences, it is not appropriate to bring Russian-American treaty disputes such as the INF compliance issue into the arena of public debate, since a bilateral commission exists for the purposes of maintaining such agreements. The task of assessing the delicacy and details of treaty procedures should belong to specialists who are qualified to make such decisions. The responsibility to find compromises lies with them, and only afterward would it be appropriate to appeal to politicians and the public. For context, the treaty on the liquidation of medium and short-range missiles was signed by the USSR and U.S. in Washington on December 8, 1987. The Soviet Union acceded to the agreement due to the 429 ballistic and cruise missiles (Pershing-1A, Pershing-2, and BGM-109G) that the U.S. had deployed in West Germany, Italy, Belgium, and the UK. Within minutes, these weapons were capable of delivering their nuclear warheads to any point in the European part of the USSR, all the way to the Volga. 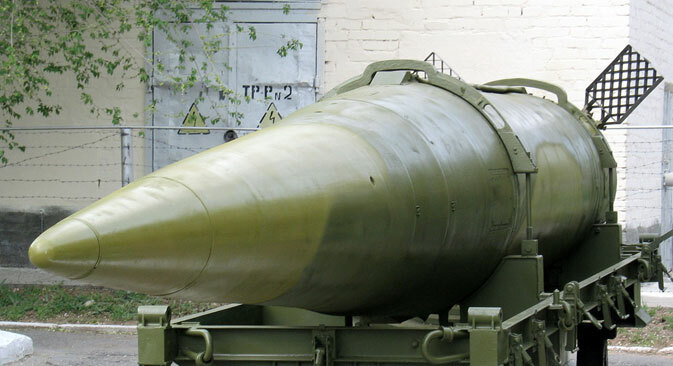 In compliance with the terms of the INF, the Soviet Union destroyed 1,752 of its analogous missiles and decommissioned 845 launchers, three production facilities and 69 missile bases. Among the decommissioned missiles were the Oka mobile theater ballistic missile (OTR-23) and its “older sister,” the Iskander-M. The latter had a maximum range of 480 km (300 miles), less than the 500 specified by the treaty, but was nevertheless included in the terms of the treaty due to Washington's insistent request. The U.S. dismantled 859 medium and short-range missiles, 283 launchers, seven production facilities, and nine missile bases.